As with many traditional dishes, gazpacho has ancient origins. It started as a bread, olive oil and garlic soup in Rome, which was quickly transferred to their colony in Spain. In Andalusia, southeast Spain, it firmly took root. By the 19th century tomatoes had become an essential ingredient, and by the 20th century, all manner of fresh vegetables were included. Today there are probably as many variations of gazpacho as there are Spaniards. But different regions produce wildly different soups. In La Mancha, it is a meat stew. In Castilla y Leon, it is a watery broth with a lot of floating vegetables. But in Andalusia, the real thing is still being made. To be classically correct you would pound garlic cloves and soaked stale bread with a mortar and pestle. That stale bread, by the way, is used to thicken the soup. Add some olive oil, and salt, pound it and you soon have a paste. 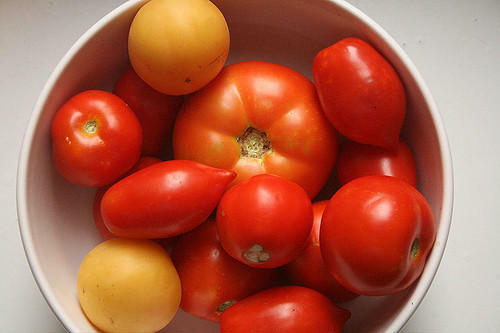 To this you work in juicy tomatoes, peeled and seeded, and some vinegar. This soup is left to rest for a few hours. It is then served with garnishes of chopped vegetables. The result closely resembles our standard American gazpacho. The big question is texture. Some people like a gazpacho that is essentially V- 8 juice with a lot of coarsely chopped vegetables tossed in. Some cynics refer to this as "watered down salsa". Other approaches call for making a purée out of at least a third of the broth and vegetables. This makes sense to me, since the whole point is to create a mélange of flavors to which you add chopped vegetables for a contrasting crunch. My advice would be to purée about 3/4 of the vegetables to fairly fine texture, season and adjust the recipe with whatever strikes your fancy; and then leave the remaining chopped vegetables out for people to use as garnish. There is a lot of agreement on the vegetables: cucumber, bell peppers, celery, onions and garlic are pretty much ubiquitous. Addressing the tomatoes, I think the best results come when you peel and seed them, and then force the pulp through a sieve or a mill collecting the juice. Big fat red tomatoes are the usual choice, but imagine the results if you worked with yellow or orange tomatoes exclusively. Or you could even go out on a limb with green tomatoes. At any rate, the juicier, the riper, the better. It's normal to see canned tomato juice or tomato paste included to increase the tomato experience. Let's address some of the many variations on gazpacho. First and foremost would be the amount of olive oil used. Some recipes call for just a few tablespoons. Others insist on at least a cup! To be sure, the original approach called for copious amounts of oil, so as long as it's high quality, fresh oil, I can't argue. Vinegar is an essential part of the recipe. Red wine vinegar is the most commonly specified. But certainly there is a place for balsamic vinegar as well. Other sauces, such as Tabasco and Worcestershire are often mentioned. And finally, balance it all with salt and pepper, and don't be afraid to use a little sugar to work against high acidity. Of course in Spain, they would use sweet watermelons to do the same thing. Here's a recipe Jerry created. Place all of the ingredients in a food processor set with the chopping blade. Purée until smooth. Pass through a fine sieve. Place the soup in a bain marie and sprinkle the xanthan gum on top. Using an immersion blender forces the xanthan gum into the soup. Season and serve chilled.